I loved reading all of your confessions in the comment section of yesterday’s post. They actually made me think of about 10 more confessions I could have added to my list. For today, I’ll stick with two confessions. First, there’s not a new recipe in today’s post. 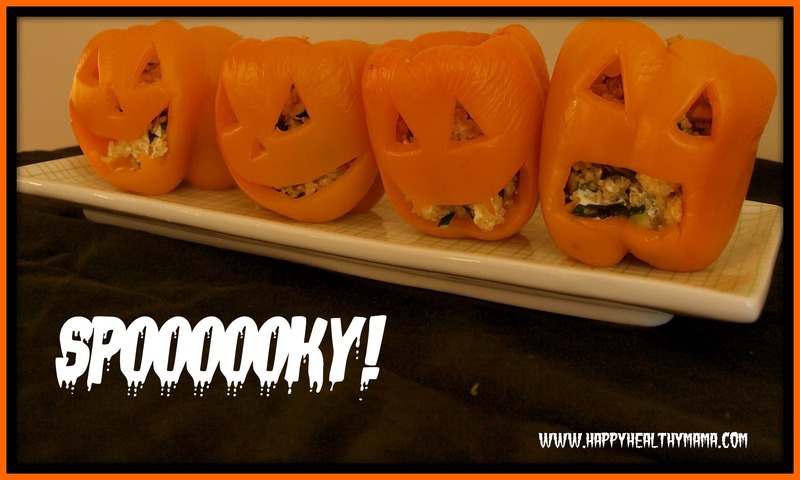 I simply used my recipe for Vegetarian Stuffed Peppers (which Tim and I both love), used all orange peppers and carved them to look like Jack-o-lanterns. Which leads me to confession #2: these are not my original idea. I first saw them on Pinterest and then the lovely Kristina posted a version on her blog, spabettie. So why am I posting a twist on an old recipe that isn’t even my own idea? Well, because I think they are darn cute and a lot of my readers (especially those with kids) might want to give them a whirl for a Halloween dinner. Meghan thought they were the cutest thing ever. She was so excited as I was carving them. As they were boiling, I explained to her that they were for dinner and she replied, “Can I have one?” Of course! She still doesn’t like food that’s all mixed together and mostly refuses to even try it. Someday, I hope she comes around. 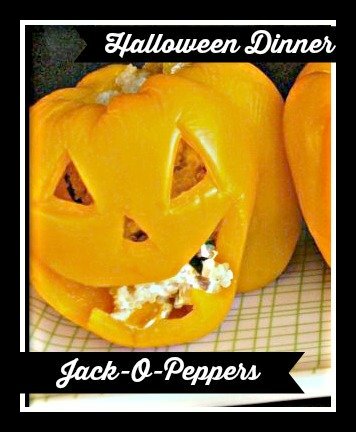 Meanwhile, I hope your kids will enjoy some Jack-o-lantern stuffed peppers this Halloween. 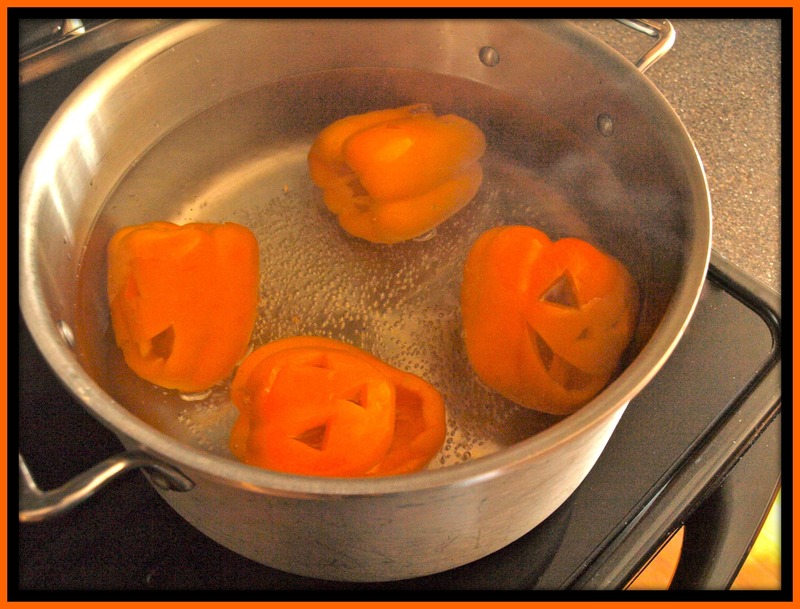 The minimal changes I made to the original recipe were to use only orange bell peppers, carve faces in them, and add the pepper carvings to the vegetable stuffing mixture. If you don’t want to use my quinoa-based stuffing from the Vegetarian Stuffed Peppers recipe (although it’s mighty tasty), try your favorite pepper stuffing. Either way, you’ll have a super cute, festive meal! SO cute! I saw them a few days ago too, and briefly considered doing it for Halloween. But then I quickly dismissed the idea because there will be way too many people here that night, and that would be way too much carving! 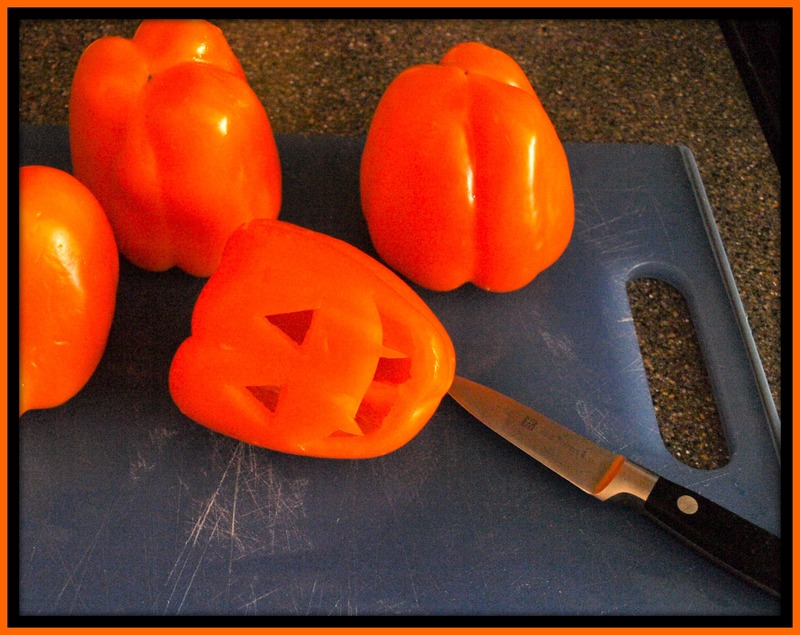 Maybe I will make them before Halloween for the 3 of us (one certain someone won’t eat peppers)… Yours turned out great! We are having risotto stuffed peppers tonight…. wish I would have thought of this before I bought red bell peppers! We love quinoa stuffed peppers so will definitely be making these on Monday night, thanks for the idea! Those are just way too cute! SO STINKING CUTE! I wish I could make these for my kids at school! Toooooo cute! SO CUTE! Oh my goodness my baby sister would love these. What a wonderful idea! Oh I LOVE these!! So creative! Perfect for halloween! Those are the cutest stuffed peppers I have ever seen!! That’s so clever! I love this, especially that little buggar on the right. 🙂 I may steal your idea, though it is tradition at my house to have chili on Halloween. These are so cute! I am definitely going to have try this! what a fab idea!!!!!! These look absolutely awesome! I LOVE this idea!!!!!!! I am sharing it on my facebook page!!! What a great idea! I’m totally making those this weekend. I don’t know if my kids (7 and 2) will eat them as they both have issues with cooked peppers, but I’m going to give it a try anyway. If anything will get them to eat cooked peppers, it will be these. Thanks for the great idea. I will be making these tonight!!!!! With quinoa!